International art dealer Ron Hall must befriend a homeless man in order to save his struggling marriage to his wife, a woman whose dreams will lead all three of them on the journey of their lives. 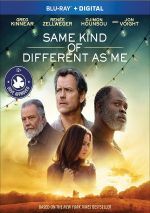 Based on Ron Hall’s autobiographical book of the same title, 2017’s Same Kind of Different As Me introduces us to… Ron Hall (Greg Kinnear). He works as a successful art dealer and lives in luxury with his wife Debbie (Renee Zellweger). Though they seem to lead an ideal life, fissures exist beneath the surface that test the marriage. 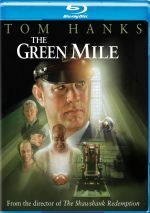 These intensify when they meet homeless drifter Denver Moore (Djimon Hounsou) and embark on an improbable relationship. I must admit that when I see the “Dove Foundation Seal of Approval” on a movie, I go into that film with certain assumptions. As stated on their website, “Dove reviews are based on Christian values and we want to serve all families and individuals who love great entertainment, but also want to spend their time and money on God-glorifying storytelling”. Whether fairly or not, that statement makes me think that Dove approved films will favor one strong worldview and condemn anything less “Christian”. A glimpse at the website shows this isn’t totally true – heck, they approved of The Last Jedi, and that’s not exactly a film teeming with “God-glorifying storytelling – but the group’s religious bent leaves me skeptical. That’s particularly true when a studio trumpets the Dove approval. I suspect that occurs to sell the movie to the Christian audience – and again, I don’t have any objection to that, but it simply becomes less likely I’ll enjoy the movie. Maybe I’ve watched too many Christian-oriented films that felt like propaganda. Though the “Dove Seal of Approval” put me on guard for Different, I wanted to give it the benefit of the doubt, mainly due to its cast, as I don’t see Zellweger, Hounsou and Kinnear as “zealots” eager to force religion on us ala a Kirk Cameron or a Kevin Sorbo. In this regard, Different manages to seem pretty subtle. While it does embrace religion to some degree, it keeps this side of the story modest. Indeed, we get no reference to religion until about halfway through the movie, and those elements never become heavy-handed. Unfortunately, most of the rest of Different lays it on thick, as it brings us a tale heavy in moralizing and sentiment but light on real drama. The film paints its characters as little more than caricatures – especially Debbie, who gets the “saint on earth” treatment. Before I watched Different, I caught part of a featurette that spells out one role’s fate. I feared this would spoil the movie for me, but that didn’t happen – mainly because the lackluster nature of character development meant I didn’t really care. Different fails to find any shades of gray here, so we mostly get broad good or bad. Ron gives us some minor shades of gray, but these stabs feel artificial and contrived. He exists mainly as the cynic who becomes a believer in humanity, and his journey lacks a sense of depth. Everything about Different seems too easy. One minute Ron views Denver as a dangerous nutbag, and the next they’re best buds. Different attempts the occasional “relapse” during which Ron shows some cynicism, but most of his growth comes across as simplistic and trite. It doesn’t help that Different brings us a slow, slow, slow trek. While 119 minutes doesn’t seem especially long for a story of this sort, the filmmakers don’t use that cinematic real estate well, so the result drags and plods. The actors add some class, but they can’t redeem this sluggish, one-dimensional enterprise. A heavy-handed morality tale, Different lacks depth or drama. Same Kind of Different As Me appears in an aspect ratio of approximately 2.35:1 on this Blu-ray Disc. For the most part, the image looked positive. Sharpness usually seemed fine. Some wide shots displayed mild softness, but those instances remained minor. The majority of the flick offered pretty good clarity. No issues with jaggies or moiré effects occurred, and I witnessed no edge haloes. Print flaws failed to mar the presentation. In terms of colors, Different went with a teal/orange feel. In particular, blues dominated and made this a stylized affair. I think the movie would’ve made more sense with a natural impression, but the hues worked fine within those limitations. Blacks seemed deep enough, and shadows showed mostly good smoothness, though some shots appeared a bit dim. This wasn’t a great image but it merited a “B”. I didn’t anticipate a slambang DTS-HD MA 5.1 soundtrack from Different, and the audio followed expectations. For the most part, the soundscape didn’t have much to do, as it tended toward general ambience. The scenes used the side and back speakers in a mildly engaging manner, and the track provided solid music from all the channels. These components didn’t bring a whole lot to the package, so this remained a laid-back mix. Audio quality was satisfactory. Music sounded peppy and full, while effects were reasonably accurate and concise. Speech sounded natural and easily intelligible. Though nothing here impressed, the track was appropriate for the material. The disc includes a few extras, and we begin with an audio commentary from writer/director Michael Carney and writers Ron Hall and Alexander Foard. All three sit together for this running, screen-specific look at story/characters and aspects of Hall’s life, cast and performances, sets and locations, music, and connected topics. The best parts of the commentary discuss Hall’s experiences and the facts behind the movie’s tale. Those carry us through the track’s slow spots, as most of the rest of it tend toward superficial elements. Listen to the piece if you want to hear about Hall’s history, but don’t expect to learn a ton about the production itself. Two featurettes follow. Love Is Patient, Love Is Kind: The Making of Same Kind of Different As Me runs 26 minutes, 54 seconds and offers info from Hall, Carney, Foard, producer Stephen Johnston, Mary Parent and Darren Moorman, and actors Greg Kinnear, Renee Zellweger, Jon Voight and Djimon Hounsou. We learn how the novel moved to the screen, story/character areas, cast and performances, and Carney’s impact on the production. Though “Patient” offers some decent notes, it largely remains superficial and sanctimonious. Did I really hear the claim that “God wanted this movie to be made”? If so, why did God allow Different to sit on the shelf for so long and to barely earn a release? Filming in Mississippi lasts 10 minutes, 35 seconds and features Parent, Johnston, Foard, Carney, and director of photography Don Burgess. They chat about various sets and locations. We get a smattering of useful thoughts but the final product lacks a lot of insight. 24 Deleted and Extended Scenes fill a total of 28 minutes, 36 seconds. That’s a lot of footage – albeit mostly short snippets instead of long added sequences. These sequences tend to expand characters, with an emphasis on some secondary roles. We also see a lot more of a prominent character’s illness. None of the cut sequences would’ve helped the final film, and I’m especially glad the sickness-related segments got the boot – they feel like misery for misery’s sake and don’t expand the movie’s overall narrative. We can watch the scenes with or without commentary from Carney, Hall and Foard. They tell us a few notes about the sequences but don’t always – or usually relate why they failed to make the film. Their commentary proves to be less informative than I’d like. Although Same Kind of Different As Me wrapped production in late 2014, it sat on the shelf for years. I can see why, as the end product lacks much depth or drama. The Blu-ray offers generally positive picture and audio along with a decent array of bonus materials. Different offers a paint-by-numbers character piece.